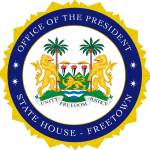 State House, Freetown, Friday 10 August 2018 – His Excellency President Julius Maada Bio has said he will support the Sierra Leone Police Wives’ Association when he turned the sod for the construction of their administrative and vocational training building at Kingtom. He said women were a key component in support for the development process of any society, stating that on countless occasions he had called on the police to rise to the challenge of keeping law and order in the country. He said the fact that they had been able to do so, meant that they had the support of their wives, and further pledged that his administration would continue to provide support to the police as they worked towards their core mandate of maintaining law and order. The President observed that the project was a step in the right direction and would create the opportunity for more women to be skilled in different vocational fields, thereby becoming more useful in society. He noted that he had chosen education as his flagship project because without that solid foundation it would be very difficult to succeed as a nation. He described education as the bedrock for the development of any nation and therefore called on women to grab opportunities the vocational center would bring and capacitate themselves enough for the competitive job market. “I am here because the aspirations of this project fall directly in line with the New Direction’s. I chose the New Direction because it is the right direction. Every nation that has succeeded on earth is one that is founded on quality education. When I speak of education, I consider vocational training as part of it and we will support it to help capacitate our compatriots as it is never too late to learn. We all cannot go to the university, we just need to be equipped with the skills and knowledge to provide essential services in our society. I hope we will have a true vocational center here that will equip police wives with the skills and knowledge you need to support your families,” he ended. On her part, President of the Police Wives’ Association. Mrs Olga Moigbe, thanked President Bio for honouring their invitation, saying that he had fulfilled a critical aspect for the police wives, especially their constitutional rights to freedom of association and shelter which were fundamental human rights. She commended the President for the astute leadership he was providing, describing him as a blessing to the country. Mrs Moigbe also noted that the building was of great importance to the institution and the country, adding that the investment in the project entailed and represented a significant boost to the image of their association. “Your Excellency, the proposed administrative and vocational training building serves not only as an economic need but also one of the most pressing social needs for the association. The setting up of this building means we can host important conferences in the subregion, get meetings with donor agencies, nongovernmental organisations and development partners. The building will address concerns of police wives, their welfare problems, training on their financial independence, help educate and improve the educational standards of the less privileged women,” she said, while calling on various stakeholders to support the successful completion of the project.